Can we say comfort food??! Perfect to make on those days when you have no idea of what to make. It’s sooo quick to make! Almond flour (affiliate link) provides a protein punch. It’s scalable. 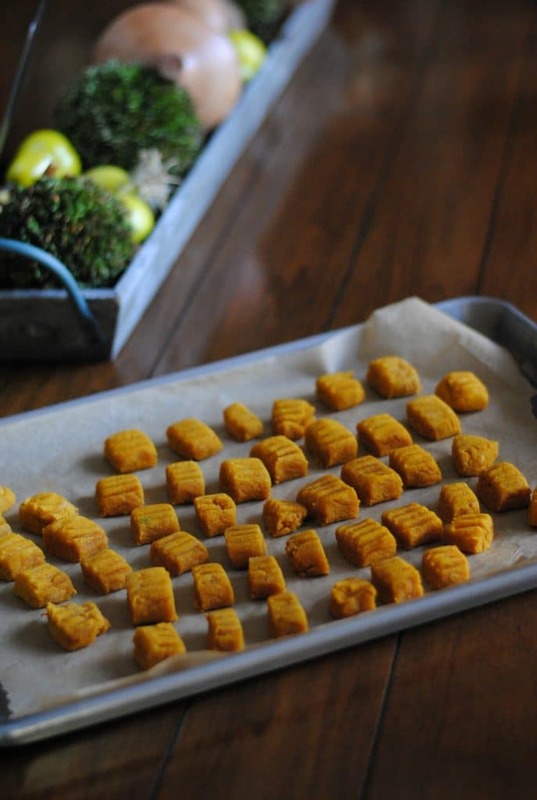 Make a small batch with whatever’s left in your can of pumpkin, or increase the quantity to make a whole can’s worth! 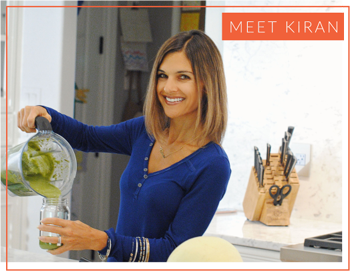 It’s paleo, vegan AND gluten-free. 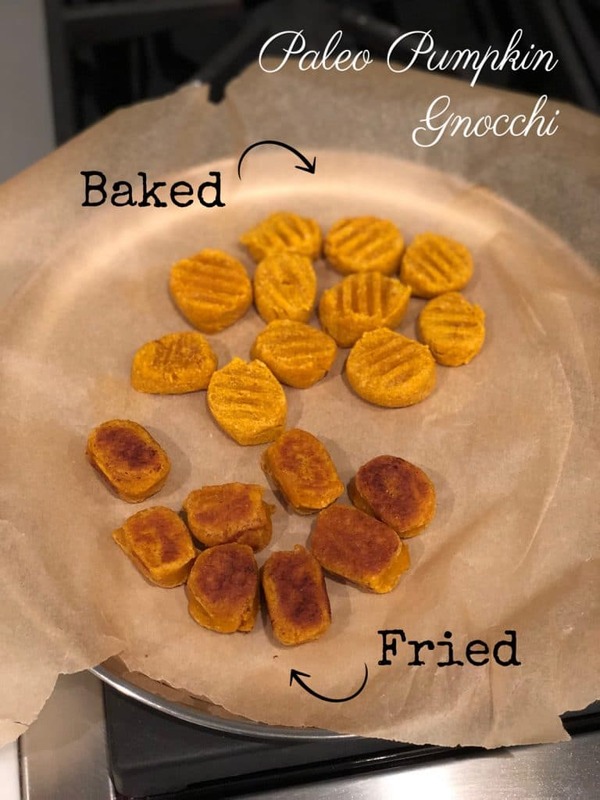 There are two different ways to make this paleo pumpkin gnocchi. Well, three, technically, but boiling this version makes it too gummy so I’m not even mentioning that one. I have had success in both baking and frying it. Both methods yield a tasty version, so it’s really up to you which way you want to do it. Try both and see which you prefer! Melt 1 tablespoon butter (I like Kerrygold salted butter) in a saute pan over low-medium heat until melted. Add gnocchi and cook for 5 minutes; flip and cook 5 more minutes, adding more butter if needed. 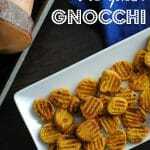 Preheat oven to 350 degrees F. Line a cookie sheet with parchment paper and place gnocchi on top. Cook for 16 minutes, flipping gnochhi halfway. 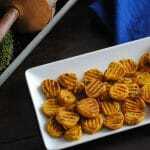 Almond flour – blanched almonds which are ground to a fine flour. Arrowroot powder is a starch made from the tubers of arrowroot plants. It’s a great substitute for cornstarch and is often used as a thickening agent in soups, stews and gravies. It creates the fluffiness in this recipe. Canned pumpkin – not pumpkin pie filling! 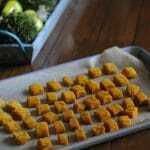 A gluten-free, vegan and paleo dish that combines just 3 ingredients into soft and comforting paleo pumpkin gnocchi. Quick to make, and quicker to be eaten! Divide into about 4 balls and roll into "ropes". Cut ropes into pieces (resembled in pictures) and use a fork to make a gnocchi-like design in each piece as in pictures. Add 1 tbsp of butter to a saute pan and heat butter on low-medium heat. When melted, add gnocchi, being careful not to overcrowd. You will need to make two batches. Cook for 3-4 minutes on each side. Repeat with remaining butter and remainder of gnocchi. If necessary, add a bit more butter as you are cooking. See notes regarding baking instructions. Serve warm on top of greens or as a side. This is best eaten fresh. I like putting this gnocchi atop a nice big salad and simply drizzling tahini on it. I also have fried some greens in the same pan that I used to fry this in and mixed that all together which was super tasty, or simply add it to roasted vegetables, or serve as a side dish. Are there are other ways to enjoy this that I may not have tried yet? Tell me about how YOU like it in the comments below! Super fun change up for dinner time! My kids would think this is super cool! 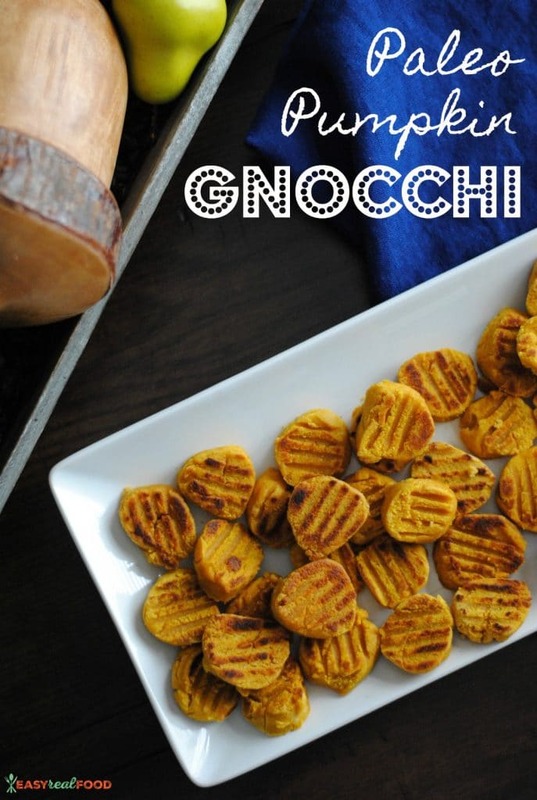 I love pumpkin and also adore gnocchi. These are the best flavor combo ever! This is such a fun meal!!! I think this might be the best savory way to use pumpkin. So yummy! Wow so creative! Such a great combo and gnocchi is my favorite. Oh my goodness! My day is made. 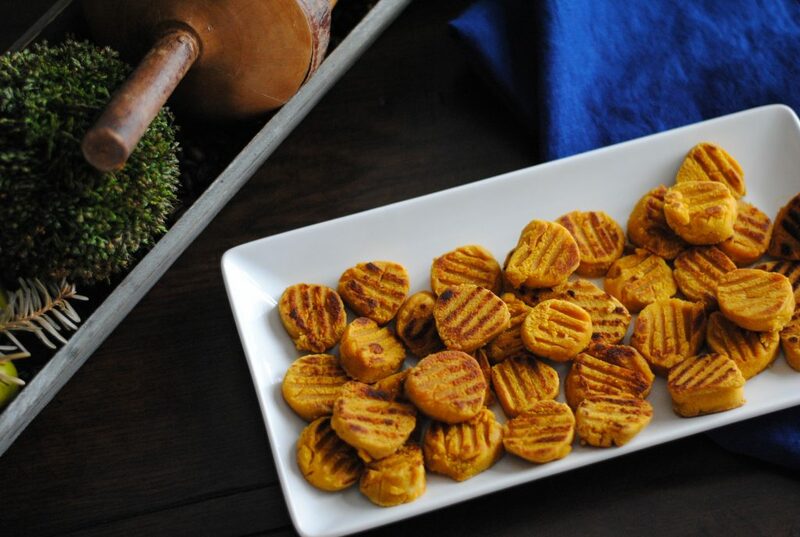 These look amazing and I have TONS of fresh pumpkin puree to use up! Yay! So glad that I can help you use it up, lol! You will love:). These look so simple! I love pumpkin!